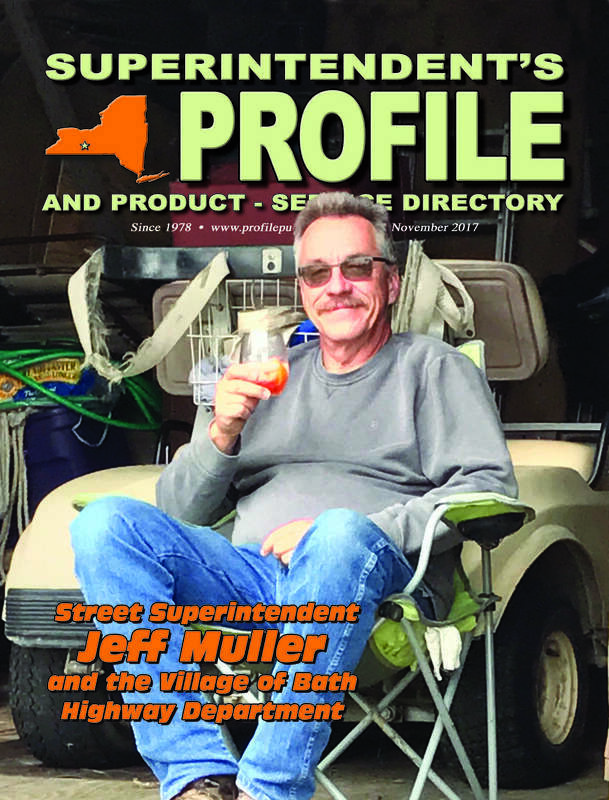 At the time of his Profile interview Jeff Muller was weeks away from hanging up his hat as street superintendent for the village of Bath after 39 years. It doesn't take long to realize that Jeff means business. A man comfortable in his own skin, he handles himself with confidence and ease as he spoke of his journey in the job. Born and raised in Bath, Jeff earned an Associate's Degree in Agronomy Conservation Recreational Land Management (a.k.a. study of the soil) from SUNY Cobleskill. “I was hired as a motor equipment operator. The gentleman who hired me retired about 18 months later. About that time, I applied for the highway superintendent's position. I didn't expect to get it. They ended up hiring someone else, but they created an assistant's position and I was appointed. The fellow who got the superintendent's job left one year later. This time, I got the job and I've been here ever since. 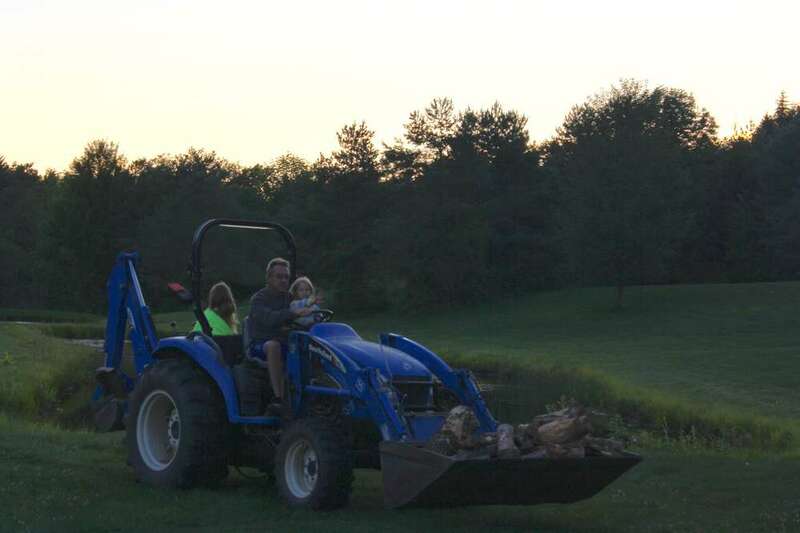 Jeff Muller’s granddaughters help him move wood on his property. Jeff is engaged to his partner, Karen Lewis. Together for 20 years, they are parents to Allyson Muller, 23; Josh Lewis, 38; and Becky Stewart, 33. They are doting grandparents to Kendall, 10, and Paisley, 6. He is a member of the Town and Municipal Highway Superintendent's Association of Steuben County, New York State Association of Town Highway Superintendents of Highways and Bath Elks Lodge #1547. In his spare time, this super likes spending time in the mountains. 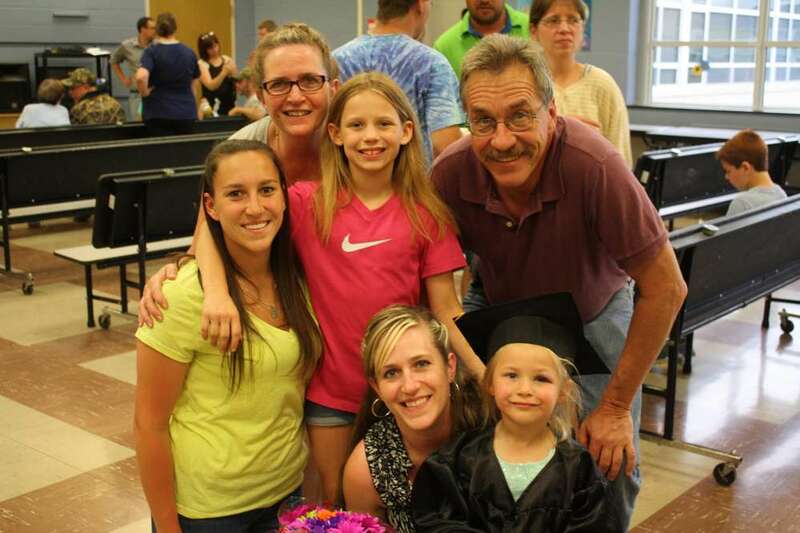 Jeff Muller and his family. He is engaged to his partner, Karen Lewis. Together for 20 years, they are parents to Allyson Muller, 23; Josh Lewis, 38; and Becky Stewart, 33. They are doting grandparents to Kendall, 10, and Paisley, 6. “Under my supervision, we built a new addition to our facility in 1993. Before that, we had a run-down shack that was probably going to collapse if I didn't do something. It was the old Madison Bus Garage. Part of the roof was flat, the other was peaked. I had an office that was in one big room along with the employee lunchroom. In 2009, the department secured a $250,000 grant to build a shared service salt facility with the town of Bath. “It was a Department of State Shared Municipal Service Incentive Grant. The village uses 90 percent of it and the town uses the rest. The cost is an 80/20 split. Our end holds 600 tons and we use approximately 1,200 tons per year. As superintendent of streets, Jeff is responsible for maintaining the village's 41.86 lane miles of road, all of which are paved. That converts into five plowing routes that take about four hours to complete. Jeff's crew of seven full-time employees help him serve the county's 5,800 residents. His staff includes: Thomas Gutow, assistant superintendent of streets; Michael Bly, Tyler Haight, Doug Seeley and Andy Spears (all MEOs); Mickey Hibbard, mechanic; and Austin Cartwright, park grounds man. Under Jeff's direction, the village of Bath Highway Department runs on a total operating budget of $13 million that includes salaries and benefits for employees and an annual CHIPS allocation of $1,982,881. The village also receives $25,847 from Pave NY and $20,475 from Extreme Winter Recovery. As prices continue to rise, how does Jeff budget for new equipment? When asked what was the most rewarding part of the job, Jeff is quick to answer. Looking back, being away from his family in the winter was the most disappointing. Now it's time for Jeff to pass the baton to the next street superintendent. So, how does he feel weeks away from retirement? In the spring of 1793, Colonel Charles Williamson stood on a precipice far above the Coshocton River, surveying the densely forested hills and valleys to the east, west and north. Williamson, land agent for the Pulteney Land Syndicate of London, had picked a spot near river's edge for the land office site of the syndicate's massive Genesee Country possessions. There he envisioned a planned city of noble homes and buildings. The community would be named Bath, after the English city, and honor Sir William Pulteney's daughter, known as Lady Bath. There are two villages and two hamlets in the town of Bath; the villages of Bath and Savona and hamlets of Kanona and Sonora. A covered overlook stands on that precipice today, easily accessible as part of Bath's Mossy Bank Park. The splendid bird's-eye view of the village, sprinkled with church steeples and stately buildings, is one of the finest in the Finger Lakes Region. Take in the view, then spend time picnicking or strolling the park's nature trails. Wildlife abounds. Osprey and bald eagles have been spotted nesting on the rocky hillside. Bath never quite reached the status that Colonel Williamson imagined as the shire city of his widespread ventures, yet signs of his vision remain in Steuben's county seat. In 1793 came Pulteney Square, still the heart and soul of the village. Spreading from the square are broad streets with symbolic names: Liberty (for the nation's newfound freedom), Steuben (for the famed Prussian general of the American Revolution), Morris (for landowner and financier Robert Morris) and, naturally, Washington. Early on came mills, a tavern and eventually, dignified homes. A theater was constructed, designed to bring a measure of culture to Williamson's capital in the wilderness. From the enduring hub of Pulteney Square to a spot on Gallows Hill where a faded historical marker reads “Robert A. Douglas was hung April 29, 1825 before a crowd of 10,000,” a rich and varied history meanders through the village of Bath. “We certainly have quite an intriguing past,” admits Joe Paddock, a Bath resident and trustee emeritus of the Steuben County Historical Society. The town's history is on full display at the historical society's home, Magee House, a fine brick structure dating from the 1830s. Columns, leaded windows and multiple marble fireplaces offer a glimpse of fashionable life in the 19th century. The museum highlights area history through books, artifacts, maps, photographs and its extensive collections. One collection features the history of a treasured and historical event — the Steuben County Fair held in Bath each August. Kicking off in 1819 with exhibits, category judging, and the dust of horse racing rising from its oval track, the exposition is now the longest continually running fair in the United States. It remains a classic mix of raucous noise, pungent odors and giddy fun. There are 4-H displays, farm animals, brightly colored fruits and vegetables, a one-room schoolhouse dating to 1845, a pioneer cabin, traditional contests, a truck pull, musical acts, carnival rides and food galore — everything that makes a fair a fair. With its vintage 1863 fairhouse and other 19th-century buildings scattered about the grounds, the fair is a colorful blend of the present with a perennial taste of times gone by — true Americana. In addition to the fair, Bath has its share of community celebrations. The Spirit of Christmas in early December offers everything seasonal from hot chocolate to chili, and from sonorous carolers to Santa Claus. In the middle of May, the Bath Community Expo, held in and around Pulteney Square, showcases classic cars, music, abundant vendors, a lumberjack contest, quirky games and a bathtub race that winds through obstacles past an enthusiastic crowd on Liberty Street. For over three decades Bath has been the traditional starting point for October's Wineglass Marathon, an ever-growing race that ends 26.2 miles later on Market Street in Corning. In contrast to the noise and bustle of its community events, Bath has its quiet and peaceful spots as well, none more impressive than the Bath National Cemetery adjacent to the campus-like Veterans Administration Medical Center. Since the first burial of Civil War veterans in 1879, almost 15,000 veterans of America's military conflicts have been laid to rest along its winding lanes. In 1987, the unidentified remains of 28 American veterans of the War of 1812 were brought from Canada and reinterred in the Bath National Cemetery. Rows of uniform white headstones cast long shadows on a cold but sunny winter's day. Spring and summer breezes carry fragrant scents of surrounding evergreens through its rolling hills. Any season is the right time to pause and absorb the cemetery's beauty and solitude, and to take a moment to appreciate the service of those who remain there for eternity. Every Memorial Day, local schoolchildren decorate each grave with a small United States flag, an impressive display and a fitting tribute from the community. Village churches are in tune with Bath's historical architecture. The imposing stone exterior of St. Thomas' (“the welcoming Episcopal Church behind the red doors”) greets visitors to Bath's Liberty Street business district. Across the way, the more contemporary Centenary United Methodist Church has retained its historical stained-glass windows from an earlier structure. At the other end of Liberty, the spire of First Presbyterian rises above Pulteney Square. The structure was designed by celebrated 19th-century architect Jacob Wrey Mould, designer of many churches on several continents, and instrumental in the construction of New York City's Central Park. “First Presbyterian is Mould's only remaining church in America, and we're quite proud of that,” says church historian Helen K. Brink. The sanctuary was created between 1895 and 1897 by Louis Comfort Tiffany using rich materials and his celebrated stained-glass artistry. From the “Rose Window” to the “Acorn Lights” to the pulpit and chancel rails carved of white mahogany from India, the recognizable mark of Tiffany is everywhere. Tours are scheduled throughout the summer months or by appointment. With its wealth of history, a walking or driving tour around Bath is time well spent. Guide booklets for each are available through the Historical Society in the Magee House. Take time to appreciate the serenity of the Bath National Cemetery. Include a drive to the Mossy Bank Park overlook, and enjoy the striking view of Bath and surroundings from the same spot where Charles Williamson may have created his vision in 1793.